Run the executable installer directly. You need to use Windows' unzip utility in Explorer or any uncompressing utility of your choice. ¿Still have problems or questions? Send us an email. 1. Download the zip file or the executable file on your computer's hard drive. 2. If you decided for the executable file skip this step. If you decided for the zip file, uncompress (unzip) the files in a temporary directory. 3. Run the file "TranslateCADsetup.exe". Note that, depending on your PC's configuration, you may need administrator rights to install new software on your machine. 4. Windows may warn you that the executable file (TranslateCADsetup.exe) is attempting to write information in your "device" (PC). As with any other software installer, you need to allow the write operation, otherwise, the software will not be installed on your Windows PC. 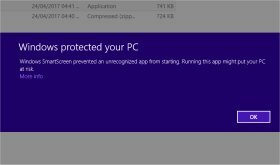 Due to the implementation of Microsoft “Windows SmartScreen” shield, in some cases you may be prompted to authorize the installation. Normally, a purple banner with the title “Windows protected your PC” is shown in the middle of the screen saying that the software that you are about to run "could harm your computer". In order to proceed with the installation, click on “More info” within this purple banner and click “Run Anyway” in order to install the software. Please be advised that our software is completely virus-free. For your security, you may verify the downloaded file with any anti-virus/anti-malware of your choice before installing. We can help you if you have problems downloading or installing TranslateCAD, please send us an e-mail clicking here. 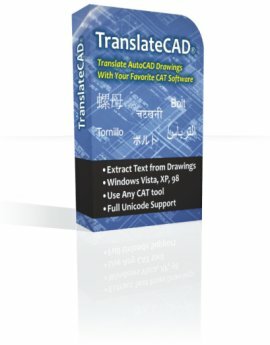 TranslateCAD is a shareware tool designed for professional translators that allows you to extract the translatable text from DXF AutoCAD drawings, creating a small plain-text Unicode-formatted file that you can translate easily taking advantage of your favorite CAT tool (SDL Trados studio 2007/2009/2011/2014/2017, SDLX, Wordfast, Deja Vu, MetaTexis, CafeTran, Across, MemoQ, MultiTrans, OmegaT, Similis, Swordfish, Transit, Heartsome, Lingotek). Compatibility with all AutoCAD DXF versions (Only ASCII DXF type supported, no binary DFXs supported): From R10 up to AutoCAD 2018. We invite you to run the trial version downloading it above, which allows you to extract the first 50 words of any drawing, regardless of its size. It fully supports Unicode for translation from/into any language (including Chinese, Hindi, Arabic, Hebrew, Korean, Russian, Thai, Japanese, etc). IMPORTANT NOTES: Current version is 1.8.3. If you are upgrading TranslateCAD please DO NOT Uninstall your prior version, otherwise you may loose your license key and will have to request it again via e-mail. Also, please make sure that you install this version into the same folder where your prior version of TranslateCAD is located. "...I found the application easy to use, and everything worked right the first time..."